PRIVATE WATERFRONT CONTEMPORARY WITH SUNSET VIEWS Relax on the huge deck, or in the Great Room with a wall of windows overlooking a sweep of lawn stretching down to White Lily Pond - a pristine 60 acre spring fed non-motorboat lake. 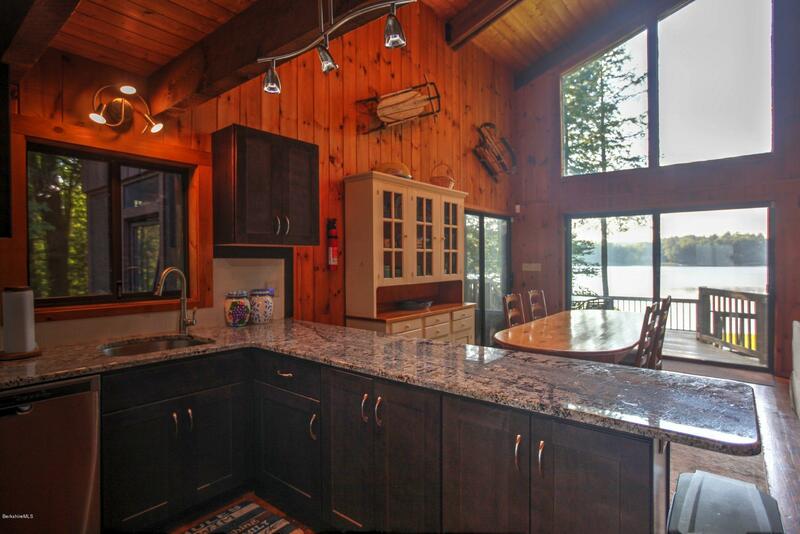 Large open-plan living with room for everybody in the BRAND NEW Open Kitchen, eating in the dining area or relaxing in front of the wood stove while looking out through the west-facing wall of glass with spectacular lake views! Screened porch & 2-level deck for outdoor living! Master on the main (2nd) floor with full bath. Upstairs on the 3rd floor are 2 more bedrooms & a full bath. Family room, 4th bedroom, 3rd full bath, storage & utility room are on the 1st floor. Right next door is a private beach & tennis! Buyer please verify all information herein.